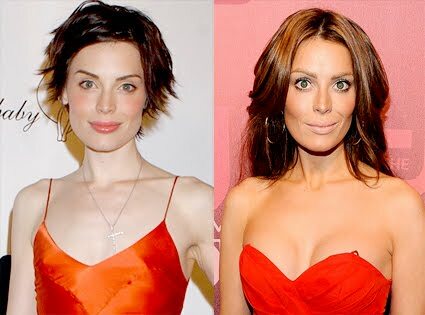 Yoanna House before and after breast implants plastic surgery. Lets hop in the time machine and turn back the clock to 2004, where we'll revisit aspiring model, Yoanna House, perhaps better known as the winner of America's Next Top Model Cycle 2. Ms. House was the slender newcomer with a lean modelesque physique, however she often received criticism about her body not being "feminine" enough, due to her lack of curves. But despite the naysayers, Yoanna House went on to win the competition which landed her in the modeling industry. Flash forward to the present day and we see a tremendously different looking Yoanna House, a makeover which did away with her fair complexion, pixie hairstyle and flat chest. And after rumors began to swirl, she came clean about her plastic surgery enhancement, with a new bouncing pair of breast implants.